In the process of Chinese industrialization and urbanization, more and more rural villagers have been transformed into urban citizens. Decades of industrialization have left China with a typical dual economic structure: people who make wages live in the cities, and peasants make a living on the land in villages around them. With the rapid expansion of city suburbs, there are always some villagers in the transition zones. As they change from crop growers to wage earners, villagers will lose their land and be accustomed to a totally new way of life. An important question is how to make these large-scale unnatural transitions as smooth and successful as possible. China provides many examples. One of the most common and successful strategies has been the establishment of cooperatives. Huaidi, one of the many successful cooperatives in China, demonstrates the effectiveness of this approach to the challenges of urbanization. Huaidi  is one of the urban villages in Shijiazhuang, the capital of Hebei province in China. It has a population of around 6000. Unlike most villages around the city, Huaidi villagers initiated a deep “one-villager-one-share” cooperative from the beginning of the urbanization process. In China’s countryside, land is collective owned and privately used by villagers, in an equal fashion, as long as their households are registered in that village. In the process of urbanization, local government compensates villagers for the land which has been taken from them, paying them a single value and a specific transition fee for several years. The value partly depends on the market, and partly on the bargaining power of villagers. Under the leadership of Chen Yuxin , Huaidi villagers received very good compensations for their lost land in 1996, 1998 and 1999. The success of the cooperative has come from these big compensations. In a weak organization, as is common in surrounding villages, villagers will get their money individually and make their living in the city on their own, abandoning the collective at that point. But Chen Yuxin persuaded the villagers to give up the first cash compensation, and bought back the land development rights in the future. 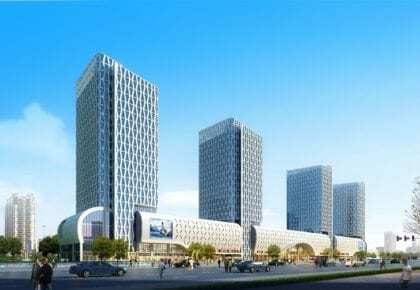 In 1996, the Huaidi villagers collected a total of 10 million yuan [US $1,475,797]  compensation to build a new shopping mall. In 1998 and 1999, according to the urban plan, Huaidi land was taken by the government to build a road and a big park, respectively. In 1998, they got future development rights on both sides of the road. 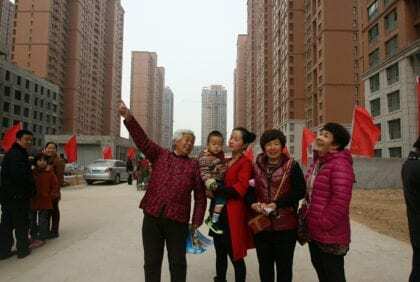 In 1999, they gave up a land compensation of 200,000 yuan [US $29,516] per mu (equivalent to US $44.3/m2, which is much lower than current land price) and bargained for a 33,350 m2 land patch, for their own future development. Most local governments are happy to accept this kind of exchange because of fiscal implications. In this way, Huaidi villagers pursue their own urbanization pattern: self-demolition, self-transformation, and self-development. Under this process, villagers get more autonomy and create their own future city life, not becoming the sorrowful victims of social policy. Their core ideal is serving the city, influencing its development, and assuring a smooth transition between city and countryside. With these development rights, Huaidi villagers have amassed billions in assets, including famous and prosperous shopping centers, a decorative empire, food street, private schools, a cultural center, and other attractions. The current annual profit is about 100 million yuan [US $14.76 million]. As shareholders, Huaidi citizens now benefit from a very good welfare system. Second, every child is free to enjoy education. Huaidi villagers have built a famous private school , which has facilities from kindergarten to high school. The high quality of this school attracts students from outside of Huaidi, who are accepted in exchange for high fees. Every year, the school organizes various kinds of activities and interaction with other famous schools throughout the world. Teachers are proud of working there. Across the country, China has nine years of compulsory education, from primary to middle school, but Huaidi offers 15 years of free, high-quality education. This private school is one part of the villagers’ collective assets, and all their own children are exempt from tuition fees. Third, every person benefits from healthcare. Huaidi has had a universal healthcare system since 1996. China, on the other hand, has employee healthcare only since 1998, and universal healthcare just since 2008. Nowadays, Huaidi citizens have double protection. All people are expected to participate in the national healthcare system, and the community pays the medical insurance premium for all collectively. Additionally, everybody can benefit from community healthcare if they choose. It only costs 10 yuan [US $1.48] per year, and supports the beneficiary with another 60% compensation for the money paid by oneself above 1000 yuan [US $148], up to 60,000 yuan [US $8,855], after national medical insurance reimbursement. Fourth, every person of age has a pension. Since 1996, every woman in Huaidi older than 50, and every man older than 60 years, have benefitted from pensions of at least 2000 yuan [US $296] per month—with larger pensions for older people. Currently, the Chinese pension system requires a minimum 15 years of contribution, whether a person is employed or not. Huaidi integrated its own pension system with the national one in 2010. People who are employed participate in the pension system via their employers. For those who are not employed, the community pays three quarters of the total annual contribution, and citizens only pay one quarter. The minimum contribution is 20% of the local per capita income in the previous year. Fifth, every person gets a whole set of benefits in kind. Everything from rice, flour, edible oil, beans, salt, eggs, beef, pork, vinegar, soy sauce, chicken powder, milk, mineral water, to all kinds of vegetables, tooth paste, toothbrush, tea, sugar, washing powder, soap, toilet paper, cleanser, towel, etc. are distributed regularly in specific quantities, enough for everybody’s consumption, all with good quality. At October 2016 exchange rates. The transition fee and the compensation for the land, are both paid by the government to the villagers, but the real land taker (future developer) should pay to the government first. Huaidi only keeps one part of this land development rights, and the other part is sold to the developer, who is the real payer of the compensation and transition fee. It is very difficult for single individuals to make good bargains during the land taking process. It is not very common for urban families to own multiple houses. So Huaidi citizens are richer than most of their neighbours. Other information in this article comes from the author’s field research. One can draw a clear line from history between a monopolized main stream media and a free press. The servile state is less well understood or appreciated as a ‘crony capitalist’ fascist or ‘big brother’ communist model, i.e. totalitarian state. This spot example reminds me of the ‘The Village’ in an old ‘60s TV series starring Patrick McGoohan. It was redone in 2009 as a mini-series called, “The Prisoner”. Perhaps the 8 billionaires that advocate a hastily and hazily uneconomic socialist calculation of basic income for everyone else would like to lead by example, give up their worldly possessions and join this village (rather than having it confiscated by the State). That would significantly add authoritative conviction to their words and remove any hint of bias or hypocrisy about robots taking your jobs. They could even open up their own village here in the US of A, divvy out their wealth to the community enterprise and call it something like, “Earth Peoples Park”. This is not to say that something like a poverty-level tapering income for adult citizens combined with APT Tax reform would not be economically beneficial to the nation. This, along with residential education facilities and medical goods & services would provide a counter-cyclical boost to employees, employers and help toward tearing down the TBTF SIFI concept and other taxpayer-backed subsidies and guarantees of the $1.2 trillion welfare state. Social Security would remain intact for citizens who paid into the system and any of the adults of the roughly 45 million still living below the poverty line would be topped-up. Oh by the way, you wouldn’t have to have your property confiscated to achieve this. This kind of cooperation requires members have some certain kind of assets, for example, land right. The real cooperative is owned by members themselves, and they can borrow capital from outside. But it is more convenient for cooperation if everybody has some kind of basic assets. It is very hard to take someone’s money to others directly, under the moral responsibility or the vision of a better society. In my opinion, that is relevant to the essence of market economy. If we want to have a good market economy, we should consider to promise everyone with some basic assets at first. Otherwise, what could they use to exchange? Where is the market? Only the labor itself? If there are no assets for the common people, their citizenship should be very solid to realize their dream. Hi, Felix, could you send me your website again? China has many cases of local dividends extremely varied in amount. Because we are in an economy transfromed from national and collective ownship to a combination of public and private ownership operated in a market mechanism, which is accorded with James Meade’s liberal socialism vision. I hope we can realize that. Everyone gets social dividend from the ownship of public assets, a more flexible wage and a low tax. We need time to investigate these cases and report their patterns. This transformation is accompanied by the rapid urbanization for decades, and the latest cases are more interesting, with more experiences. Very interesting system. China certainly have it’s social and political problems, but the model outlined by this article is nothing short of amazing. To be so successful in a collective sense shows how important it is in balancing public policy to benefit community as well as profit seeking/private investment. Make the public/private sectors more dynamic, have greater synergy, have better results for everyone. I´ve read your article with big interest and wanted to contact you privately to invite you for an event in Shanghai in order to provide you an opportunity to speak in public about your insights, ideas and visions. I would be very glad if you can email me back.